Los Suenos resort is, as many know, a very exclusive Golf course and Marina situated on the Pacific Ocean in a protected cove called Herradura Bay. The entire resort has 6 restaurants, Four-Star Marriott Hotel, exclusive 18 hole golf course, casino and a full Marina village includes high-end shopping and art galleries surrounded by impeccable grounds. The attention to detail on the grounds here is unsurpassed. Multiple pools and hot tubs with gorgeous cobblestone roads connecting the properties adds to its charm. It is about 5 min from the town of Jaco. Jaco is a Costa Rican destination with endless activities for all ages. The Town is known for its excellent surfing, plentiful resturants coupled with shopping and night life. The striking setting and property make Los Suenos an exceptional place to stay. Check it out. Its not exactally roughing it. You will be pleasantly surprised. This location is a perfect mix of a fancy golf course/marina locatios with striking grounds and lots of amenities...it is gorgoeus and quiet at night, with the option of 'party town' Jaco spicing up every night just 5 min away. Has access to the Los Suenos beach club and sand volleyball court. Maid service is available. The price of the unit includes the cleaning at the end, including changing linens, trash, etc. The management service is available 24/7 and is very knowledgeable about the area. They can arrange all kinds of activities and excurtions from offshore fishing to setting up a Golf cart rental for the week. Nice condo with a fantastic view of the grounds, golf course and ocean. There were two nice sized pools just steps away from the condo. The condo includes entry into the beach club pool which was great. It was about a ten minute walk in the hot sun which wasn’t ideal but worth it as this pool was huge and the setting was beautiful. There was plenty of parking at the beach club pool if you have a car. This pool had a full restaurant and swim up bar so we spent most of our time there. Just a few comfort upgrades would help but. The beds, sheets and pillows on the were fine but not fully up to what we expected. .overall it was a great place to stay and would recommend. The porch and the view were. The standout features. Great location and beautiful condo. This is beautiful three bedroom condo in the Delmar section. It is very quiet with amazing views. Most days you will have 1 of 4 pools to yourself. Clean, neat, safe, and a blast! We had a great time relaxing at the resort pools and playing in the ocean. Kids enjoyed every moment, and my wife and I had a chance to relax. Made some great family memories! The condo was beautiful, and the Del Mar pool area and complex is quiet and peaceful. The view from the balcony was AMAZING. We stayed with our young kids and had a blast. My two year old did not want to leave. The location is great as well as Los Suenos is beautiful and has plenty in the area for family fun. This condo was perfect for our family of 5! Waking every morning and watching the Scarlet McCaws fly by while drinking coffee on the balcony was awesome. The resort itself was exceptional, lots of restaurant options and plenty to do! I would recommend renting a car or golf cart, as the resort is quite large. And there is a grocery store near by so it makes getting supplies very easy. Overall, this was a wonderful vacation for our family and I would happily rent this condo again. Los Suenos resort is, as many know, a very exclusive Golf course and Marina situated on the Pacific Ocean in a protected Bay called Herradura Bay. The entire resorts has 6 resturants on site and a full scale Marriott with 18 hole golf course, full marina village all surrounded by impecable grounds. 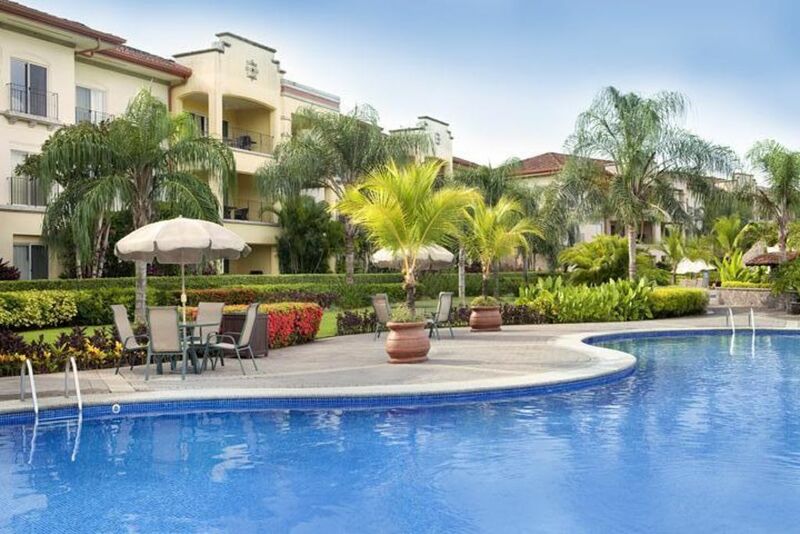 It is about 5 min from the town of Jaco with bustling activites, shopping, night life. There is upscale shopping on the property but i encourage guests to get out of the local area on day trips and explore what Costa Rica has to offer. The Marina is probably one of the finest in all of Central America, about 200 gorgeous boats are part of the fleet and offer all types of offshore and inshore fishing. A gorgeous setting and property make Los Suenos an exceptional palce to stay. Golf: First Class Golf Course where the Jungle meets the Ocean.